The IFA Fair, considered the business event No 1 for the consumer electronics and home appliance industry, has kicked off. Gorenje is happily returning after last year's successful appearance. This year, they are to unveil their novelties. In addition to the new Gorenje Retro Collection and the Gorenje Simplicity Line, the spotlights will be on the company's team-up with the global icon of industrial design, Karim Rashid, which has resulted in the brand new star collection "Gorenje designed by Karim Rashid" – a collection Gorenje certainly has high hopes for. Following the cooperation with the famous Italian design studio Pininfarina and the keen French designer Ora-Ïto, Gorenje is now betting on the talent and boldness of prolific designer and undisputed king of colour, the man who made pink masculine: New York-based designer star Karim Rashid, creating a brand new collection "Gorenje designed by Karim Rashid." Teaming up with Gorenje was a perfect opportunity to pursue a desire Karim has had for ages: to introduce design into simple, everyday objects such as household appliances, to marry his imagination to advanced technology, and to create a top-class collection of appliances that will provide a memorable experience for all senses. Gorenje is equally thrilled about the collaboration with Karim. They are impressed by his charisma and the daring colours featured in his designs. To evoke the appearance of colourful elegance, they decided to employ LED technology, regarded as an innovative lighting solution of the future. 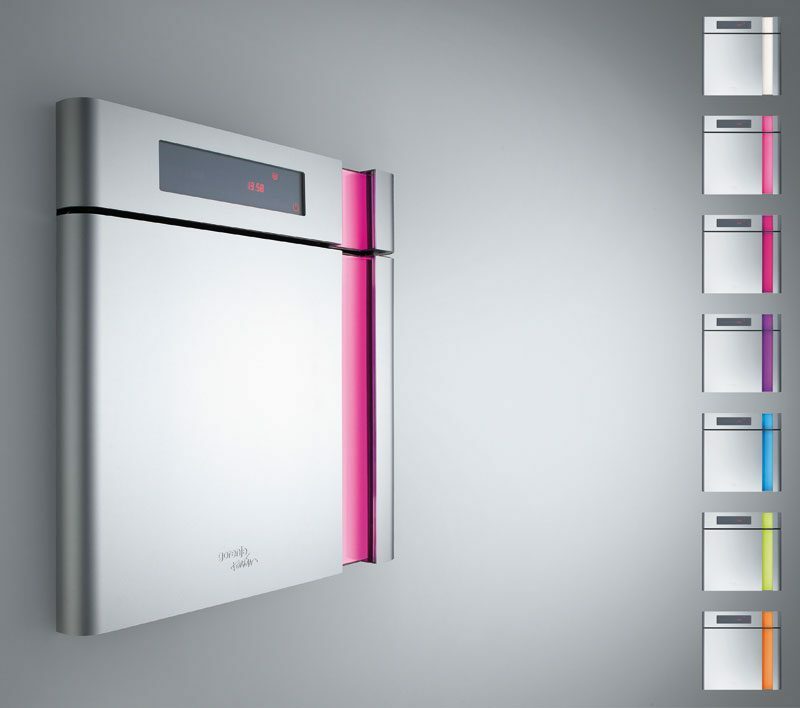 “Hence, Gorenje is the first home appliance manufacturer to offer a solution that allows the users to change the colour of their oven or refrigerator exterior. The vertical LED light stripe allows several colour versions, providing the option to adjust the appearance of the appliance to one’s current mood, or indeed one’s lifestyle", commented Mr. Sandi Uranc, Gorenje marketing director, upon the premiere in Berlin. 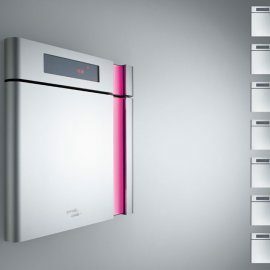 The combination of the undisputed talent of the world-famous designer icon Karim Rashid and Gorenje’s high quality execution of all details, and application of durable materials, are the essential elements that make a memorable collection. The collection was premiered at the IFA Fair this year in Berlin; its market launches are expected in this December and early next year. The new innovative collection addresses the more demanding customers, the admirers of excellent design and timeless beauty. Karim Rashid is an award-winning industrial designer who has undertaken projects for hundreds of clients all around the world. A luminary in the world of international industrial design, this prolific designer and undisputed king of colour comes from New York, where he applies his talents to numerous fields: furniture, architecture, lighting, tableware, and - from now on household appliances. Working with clients as prestigious as Issey Miyake, Kenzo, Alessi, Sony, Artemide, Umbra Toyota and Bozart, his career path has been lined with international awards such as the Sleep05 for the renovation of the Semiramis Hotel in Athens. Karim is a perennial winner of the Red Dot award, Chicago Athenaeum Good Design award, I.D. Magazine Annual Design Review, IDSA Industrial Design Excellence award. He holds honorary doctorates from the Ontario college of Art & Design and Corcoran College of Art & Design. 2007 highlighted Karim’s largest retrospective to date at the Instituto Tomie Ohtake, in Sao Paolo, Brazil. Most recently, Karim curated the exhibition Totally Rad: Karim Rashid does Radiators for Museum of Art and Design in New York City. Karim is a frequent guest lecturer at universities and conferences globally disseminating the importance of design in everyday life. IFA 2009 is the industries’ global trend indicator, a market place for innovation and a meeting place of the world’s leading executives. From 4 to 9 September 1,164 exhibitors will be represented on the Berlin Exhibition Grounds at the world’s largest trade fair for consumer electronics and electrical home appliances. 121,000 square metres of display space have been rented out, maintaining the record levels achieved last year. In a year dominated by recession IFA has proved itself to be a trade fair of exceptional standing worldwide and a premium event. Regular participation by leading CE companies and the growing numbers of home appliance manufacturers in attendance reflect IFA’s success and stability. IFA with its unique and successful concept is an ideal venue for the industry and trade to conduct long-term business.